To celebrate the arrival of New Orleans’ newest cruise ship, Carnival Triumph, Carnival Cruise Line and the Port of New Orleans hosted an entertaining charity event today with representatives from four local music organizations competing for $35,000 in donations to music charities. 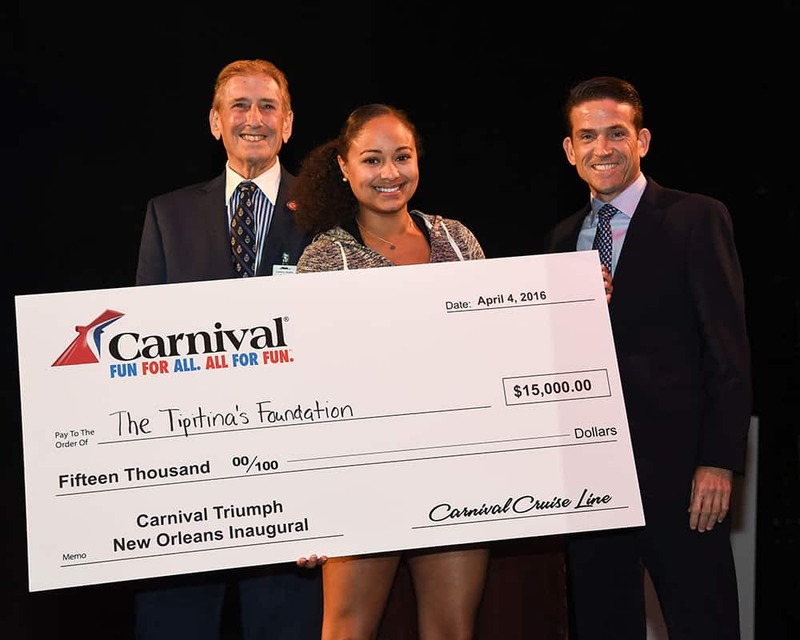 Singer Robin Barnes took first place and earned a $15,000 donation from Carnival Cruise Line for The Tipitina’s Foundation. Trumpeter/vocalist Shamarrt Allen, competing on behalf of the Louis “Satchmo” Armstrong Jazz Camp; singer Robin Barnes, competing for the Tipitina’s Foundation; saxophonist Derek Douget, representing The New Orleans Jazz and Heritage Festival and Foundation; and Rebirth Brass Band Drummer and Roots of Music Co-Founder Derrick Tabb participated in a series of hilarious “minute-to-win it” games with Tipitina’s Foundation taking home first prize of $15,000. The other groups split $20,000 in runner-up contributions toward the charities each were representing. Officials from Carnival Cruise Line, including Carnival Triumph Captain Alessandro Iemmi, Vice President of Commercial Port Operations Carlos Torres de Navarra and Vice President of Field Sales Mike Julius, along with Port of New Orleans President and CEO Gary LaGrange hosted a traditional maritime plaque exchange to commemorate the ship’s arrival at the port. Carnival Triumph represents a 34 percent capacity increase on the line’s four- and five-day cruise program from New Orleans. Together with Carnival Dream, which operates year-round seven-day voyages, Carnival is expected to carry 450,000 passengers annually from the renovated Erato Street Terminal, representing the largest ever capacity commitment by a cruise line in New Orleans. Carnival is the only cruise line to operate year-round from New Orleans and offers the widest variety of cruise durations and itinerary choices from the Big Easy, visiting tropical destinations in Mexico, the Caribbean, and the Bahamas. “New Orleans has been a valued partner for more than 20 years and today’s event was a wonderfully fun and unique way to celebrate the arrival of Carnival Triumph and support some of the city’s most treasured music organizations,” said Torres de Navarra. “We would like to thank our friends at the Port of New Orleans, the local community and our incredible travel agent partners for their continued support which has enabled Carnival to become the Crescent City’s number one cruise operator,” he added. Carnival Triumph kicked off its New Orleans-based program today with a four-day cruise to Cozumel, Mexico. On this route, four-day “long weekend” cruises depart Thursdays and call at Cozumel while five-day sailings depart Mondays and Saturdays and visit Cozumel and Progreso. Carnival Triumph will also offer a special three-day cruise round-trip from New Orleans April 8-11, 2016. Carnival Triumph has undergone an extensive enhancement program that added a number of innovations, including Guy’s Burger Joint — developed in tandem with Food Network star Guy Fieri — poolside watering holes BlueIguana Tequila Bar and RedFrog Rum Bar, the BlueIguana Cantina Mexican eatery, cocktail pharmacy-themed Alchemy Bar, and Cherry On Top, a “candy and more” store. Carnival Triumph also features more than 500 staterooms and suites with private balconies — highly desirable accommodation categories not generally available on other short cruises.